So it's been an eternity since I posted a new blog. I have a good excuse. We moved. We're still unpacking. Everything is nuts. If it weren't for my sporadic Facebook updates, I'm pretty sure my friends would think I was lost in the Black Hole of Calcutta. But things are slowly coming together and now I'm trying to organize all the things that are still in a mad just-shove-it-somewhere-out-of-sight post-moving jumble. 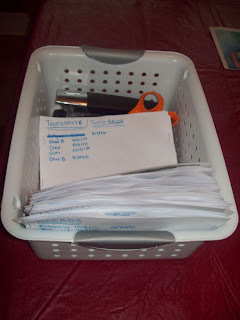 The first thing I've tackled is my coupons, because it seemed like the most manageable thing on my plate at the moment. 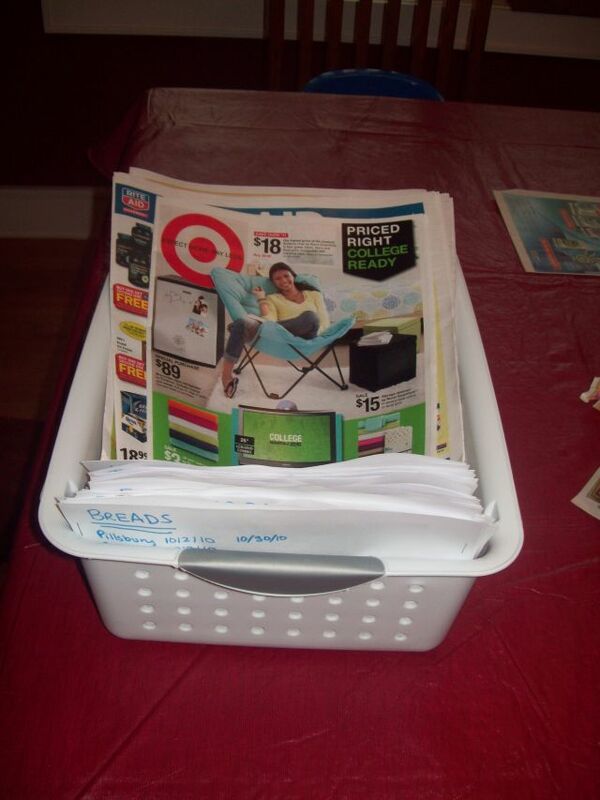 That, and my friend Ruth, who writes a blog on couponing and saving money in general, has really inspired me with the amazing haul she's bringing in courtesy of a few little scraps of paper. You can read her blog, Living Well, Spending Less here. I tried to use coupons in the past with mixed results. I alternated between a coupon accordian file and a big binder with clear pages, and I was still not always finding the ones I needed, mostly because they were always in a jumble, and it took me forever to go through them all, matching what I had to the gazillion products for sale in the Sunday fliers. I would like to save money AND have a life, thank you. When I take a coupon out, or it expires, I simply cross it out. The beauty of this system is that I can add and subtract coupons until I run out of room, and when that happens, I can just make myself a new folder. 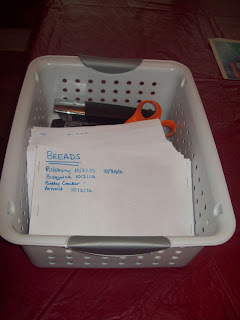 When I tried this system out this past week, I was able to find the coupons I needed easily and saved about 50% on my grocery bill. Also, I have a major clutter problem, so I keep scissors, the stapler, extra staples, my marker, and all the Sunday fliers in the back. If the rest of my organizing goes so well, I'll be in really good shape! You can read about some tweaks I made to this system here. wow. i used to be the great coupon saver regularly...not so much lately. thanks for the reminder and the tips for organizing. my old system was to make my gorcery list, and out of my envelop of coupons, find the ones best sutied to the list before leaving the house, then going with list and essential coupons only to the store and with a specific budget in mind, appropos to the list/coupon estimation. then remind myself when i reached for the pepperidge farm cookies, that they are not on the list this week, and i do not have a coupon for them. I love that idea for clipped coupons! I don't clip a lot of mine anymore, ( I just file the entire newspaper insert by date), but I still end up with a billion loose ones from other places that I have a hard time keeping straight. Right now I have them in envelopes similar to your folders, but it never occurred to me to write on the outside what was in each one. Thanks!